A Toys Orchestra originate from Selerno, Italy, and have apparently released a number of albums before this, but they're new to me. And they're not bad. Not bad at all. Especially on Invisible, the opening number of Technicolor Dreams which starts like a, gulp, Lionel Richie ballad, and then develops into a lovely aching piano based Supertramp-like 70s number. I know I'm probably not selling this too well, but really, don't let this put you off because it's got a genuinely great rousing chorus. It's hard to pin A Toys Orchestra down though. Cornice Dance is an up-tempo, boppy Supergrass type song with a Beatle-ish bit in the middle, whilst Mrs. Macabrette has a Kinks Lazing On A Sunday Afternoon feel. Letter To Myself, meanwhile, is very Coldplay, though admittedly it's like Coldplay at their best, whereas Danish Cookie Blue Box is less successful and sounds like Coldplay at their most average. Indeed the album goes off somewhat as it goes on. Powder On The Words is another 70s-like ballad, but it isn't in the same class as Invisible. Amneay International is a Libertines-like thrash that is enjoyable enough without ever setting the world on fire, whilst Technicolor Dream is a dreamy number most notable for having an A Day In The Life-like ending happening in the middle. Ease Off The Bit is pretty good though, opening in gentle acoustic style before changing to something that sounds like a cross between some 80s synth hit and The Vapors hit Turning Japanese, with a furious Jam Funeral Pyre-like bass section thrown in for good measure, too. And Santa Barbara is a grower, too, sounding like a poppy take on the type of thing that Pere Ubu's David Thomas does when armed with an accordion. But otherwise… some numbers like Bug Embrace and Be 4 I Walk Away (despite its melodic intro) just aren't memorable enough. This, however, is all rectified in fine style with the closing track Panic Attack #3. A tinkly piano plays as a clock ticks away in the background before some girl singer's pretty la la la's come in and the track builds. It's like something from a 60s movie, the type of thing that Air do so well. You think you've heard it before and maybe we actually have, but I'll be buggered if I know where. And frankly I don't care because it's a cracking track, ending the album on a real high. 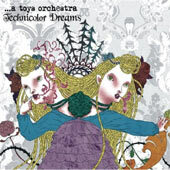 So an interesting release, but if they can come up with a whole album as strong as the opening and closing numbers A Toys Orchestra will really be worth investigating.